SIR: In pursuance to orders, I have the honor to report the part taken by the Twenty-fourth Regiment Indiana Volunteers in the battle of Champion's Hill, Miss., on the 16th day of May, 1863. On the 16th instant, at 6 a.m., we moved from our camp near Bolton Depot, 4 miles distant from the battle-ground, in the direction of Edwards Depot, at which point the enemy were reported to be in force. My command being in advance, I was ordered by General McGinnis, commanding brigade, to move three companies of my command to the front. I immediately sent Companies C, F, and I to the advance and again resumed the line of march. At about 10 o'clock in the morning, as we approached the hills, we were apprised by our cavalry advance that the enemy were posted in force in front, on Champion's Hill. General McGinnis then ordered me to form my line of battle on the right of the road leading to Edwards Depot. At 10.30 a.m. our line of battle as a brigade was formed, and ready for action. A few minutes after, I was informed by a signal officer that there was a force of the enemy maneuvering to the right. I immediately sent Companies A and K to the right, and Company G in support of the skirmishers in front. They had hardly deployed in line before firing commenced on our right, the enemy making an effort to turn it. At 11.30 a.m. I was ordered to advance in line of battle, and by 2 o'clock my command was in close contest with the enemy, whose force exceeded ours by more than five times our numbers. Our line advanced from where it was first formed nearly 60 rods, across the timber, when I discovered the enemy in large force moving to my right, and making an effort, as I supposed, to capture our batteries, stationed in the field to the right. I at once halted my command and poured a galling oblique fire into his flank. This, with the destructive fire of the artillery, checked for a time their advance. By this time the action became general along the whole line, and very severe. From the edge of the timber we drove the enemy, step by step, for nearly 800 yards, over deep ravines and abrupt hills. At this time the rebels were heavily re-enforced, and again the struggle commenced, the most desperate and destructive of the day. While engaged actively with the enemy, I received notice through Captain [John F.] Caven to come to the support of the center of our line, which was sorely pressed by the left flank, and in a few minutes became again engaged with the enemy in strong force. This point I contested against superior numbers for nearly an hour, under the most galling fire I ever witnessed. Again the enemy massed their forces and threw their whole weight upon the right and center of our line, and here my men fell by scores, but yet with determined bravery held the enemy in check, and again it became necessary for me to change my position, as the enemy's fire was converging upon my lines. I moved to the rear about 75 yards, and again opened fire upon the rebels, who were still pressing forward. Here we stood before a destructive fire fifteen minutes, when I was compelled to change my position, and again for twenty minutes we fought ten times our number. At this time word came to me that the left of the division was giving way, and that our troops to the right were overwhelmed, or nearly so. I again fell back and formed a line, returning the enemy's fire, which was kept up for a considerable time. Here it was that our colors fell. The gallant Lieutenant-Colonel Barter, believing that the bearer was wounded, rushed forward, seized them, and waved them with cheers in the very face of the enemy. The flagstaff was shattered and Lieutenant-Colonel Barter severely wounded. Being entirely out of ammunition, and overwhelmed in front, my command fell back nearly 300 yards, and here the Eleventh and Twenty-fourth formed a new line, replenished their cartridge.boxes, and again advanced to the field. By this time we were sufficiently re-enforced, and in less than an hour the enemy gave way, leaving our gallant troops in full possession of Champion's Hill. But amid our rejoicing over this great victory we are called upon to mourn the gallant dead. Capt. Felix G. Welman, of Company B, Second Lieut. Jesse L. Cain, of Company A, and 27 others of my command fell at their post, nobly and gallantly performing their whole duty. Let their names be inscribed in the hearts of our people, and their memories revered as noble patriots and gallant soldiers. I shall feel the loss of these men, together with the loss to the service of the gallant Lieutenant-Colonel Barter and Lieut. J. H. Baldwin, who are so severely wounded as to leave me without the benefit of their valuable assistance for a considerable time. I desire also to make mention of Capt. N. F. Bolton, Lieut. Daniel Smith, Lieut. Frederick T. Butler, and Asst. Surg. T. W. C. Williamson, who were severely wounded while engaged in the gallant performance of their duty. Adjt. S. R. Henderson and Capt. Hugh Erwin, Lieutenant Smith, Company C; Capt. F. M. Downey, Lieut. Frank M. Robbins, commanding Company F after Lieutenant Baldwin fell; Capt. Charles S. Jenkins, Capt. 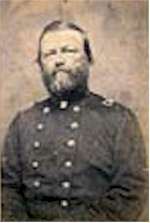 John B. Hutchens, Capt. Benjamin J. Summers, and Captain Redburn, with their subordinate officers, are deserving special notice for the ability and zeal with which they performed their duty. The men, without exception, did gallant service, and stood up to the galling fire of an overwhelming force for three hours and twenty minutes like veterans, and Indiana and the country generally may well feel proud of the gallant men engaged in the greatest battle of the war. My loss in killed and wounded was 207 out of a force of less than 500 men.